Data from a multitude of studies makes the case that money is better spent elsewhere.. There is little controversy within the academic and scientific community that surveillance cameras don’t work, either to prevent or solve crimes. City-wide surveillance cameras have been around since 1994, and in the last two decades there have been numerous studies on their effectiveness. They show that it’s minimal at best. Perhaps the most extensively studied camera system is also the biggest: England’s. Put together, England and Wales have 4.2 million cameras and, not surprisingly, the British government was interested in finding out if they worked. In 2002, the Home Office conducted a meta-analyses of the studies published until then and found that taken together the studies showed no reduction in crime. While some of the studies analyzed did show a small reduction in crime, these were mostly on parking lots and cameras had been added in addition to other improvements (such as increased policing and lighting). In the two cases where cameras alone were added, crime either didn’t change or actually increased. The Home Office conducted another meta-analyses in 2005 with similar results. Researchers found that only one out of 13 sites studies showed a statistically significant reduction in crime, and that fear of being victimized did not decrease either. Cameras have also been of very limited use to solve crimes. In 2009, British police complained that only about 3% of robberies were solved through cameras – a ratio of about one solved robbery per 1,000 cameras. While they had many excuses as to why the cameras were not more effective in a country that is blanketed with cameras, the fact remains that Police were able to solve 97% of robbery cases through traditional police work. 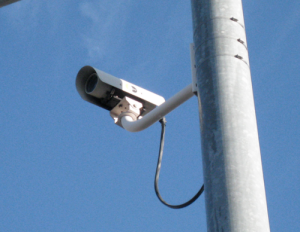 San Francisco has recently acknowledged that its surveillance camera system is a waste. A 2008 study showed that surveillance cameras were effective at reducing property crime within 100-feet of the camera only, beyond 100 feet they were useless. Surveillance cameras were also effective in displacing violent crime to 250 feet away from the cameras. The overall rate of violent crime did not decrease. A 2008 USC study showed that areas with surveillance cameras had the same reduction in crime rates as areas without them. Here, researchers did find a statistically significant reduction of crime of 13% overall in target areas where cameras had been placed. However, most of that reduction was in disorderly, rather than serious crimes, and it was not uniform – in some areas there was no difference or displacement into nearby areas. – In Washington DC, cameras did not have a deterrent effect at all. They hypothesize that surveillance cameras don’t work at all unless they are monitored live. – In Chicago, they evaluated two neighborhoods where cameras were installed and were under live monitoring. The found that crime reduction in one one of the neighborhoods could be attributed to the surveillance cameras, but not in the other. However, during the period of the study the neighborhood that saw decreases in crime attributed to cameras, also saw significant gentrification as well as police initiatives in surrounding areas. It’s therefore questionable whether the crime reduction seen in the study can be attributed to the cameras. Moreover, an ACLU paper shows that only 1% of arrests involved cases caught by the cameras, and there were no prosecutions. – In Baltimore, researchers found that reduction in crime rates could be attributed to cameras in some neighborhoods but not in others. This suggests that factors other than the surveillance cameras may be at play here as well. I wouldn’t be surprised if that would be the same fate of the surveillance camera project in San Leandro. That is an excellent compilation of studies illustrating just how much of a waste surveillance cameras are. It’s one of those moves that cities engage in to calm their residents when I’m sure they’ve seen the data and they know these cameras are no solution. Thank you for putting the information in one place. I only wish the city of San Leandro would listen.